The places to solder the U2, U3 and IC1 chips to the board are too short to comfortably hand-solder. They need to be extended. The first pin of the IC1 chip is not labelled. In the schematic, the numbers of the pins connected to SDRAM were mixed up. This mistake was easily fixed in the firmware of the FPGA, yet this still needed to be adjusted on the schematic. Some incorrectly labelled pins (J7 needs to be F7 and F7 needs to be E7). Yet again, this can be fixed using the FPGA firmware, but some changes were still applied to the circuit and silkscreen. You also can download the BOM and Gerber files. In the BOM, the resistors and capacitors are type 0805, if they aren’t specified. Also, for reference, I provided some component codes for element14, RSOnline and DigiKey. WARNING! 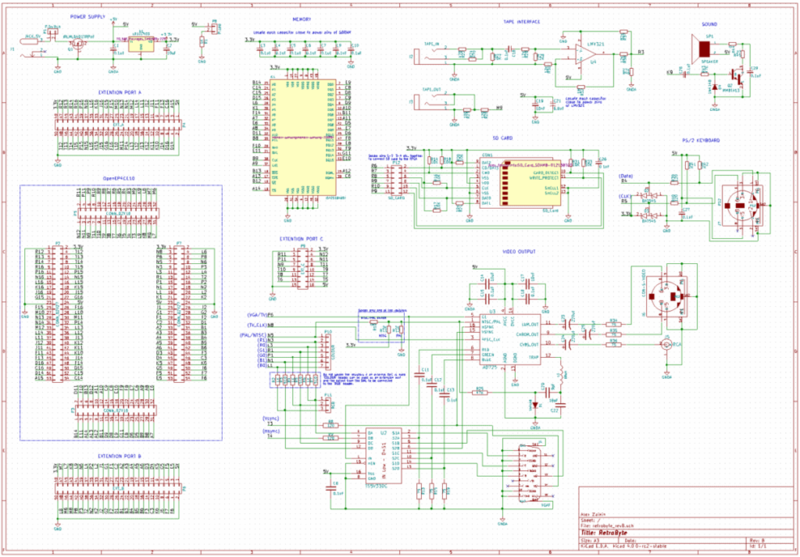 This revision was not yet tested, so there are likely to be some mistakes in the schematics, board or BOM. If you choose to replicate the schematic, please be careful and check everything yourselves; also note that you are doing this at your own risk and any complaints will not be welcome. Retrobyte is still a work in progress, and of course, I will be greatful for any comments on any inaccuracies or mistakes that I have made.